For many centuries, artists had been travelling to Pondicherry to document its serene vistas - an amalgamation of Christian and local elements in architecture, as well as the urban sprawl. Antiquarian maps from the 18th and 19th centuries reveal an intricately Europeanised Indian town, featuring a shared use of motifs and style. The arrival of commercial photographers Bourne and Shepherd, or indeed the mysterious French photographer C. (possibly Charles) Moyne, brings forth an expansive city of citadels and churches, with broadening boulevards lined with trees. 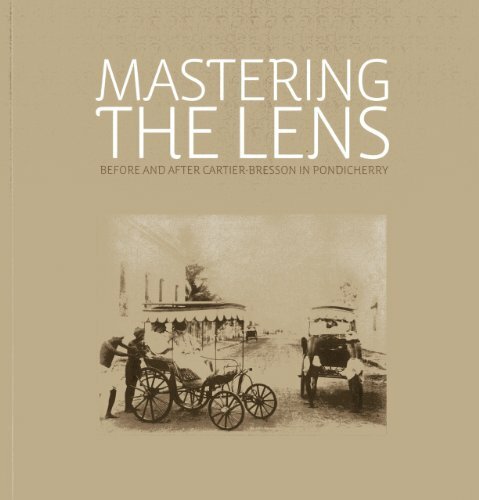 The visual material is further complimented by some extraordinary images taken by Indian practitioners from the same period such as Tara Jauhar and Venkatesh Shirodkar at Aurobindo Ashram, published here for the first time. This publication emanates from an exhibition by the same title held in September 2012 in New Delhi. Drawn exclusively from The Alkazi Collection of Photography, at the core of this initiative is the unpublished album by renowned photographer Henri Cartier-Bresson, co-founder of Magnum Photos, who visited the Aurobindo Ashram in April 1950. He took the last pictures of Sri Aurobindo Ghosh in the company of his spiritual companion, 'the Mother'. In addition, he meticulously penned his observations, creating a meta-text around the images, which presents a biographical and anecdotal supplement to his photographic endeavour. Rahaab Allana is the Curator for the Alkazi Foundation for the Arts, New Delhi. Shilpi Goswami is the Archivist at the Alkazi Foundation for the Arts, New Delhi. Deepak Bharathan is Research Scholar at the Alkazi Foundation for the Arts. Kittu Reddy teaches History, Political and Social Thought of Sri Aurobindo at Sri Aurobindo Ashram, Pondicherry.